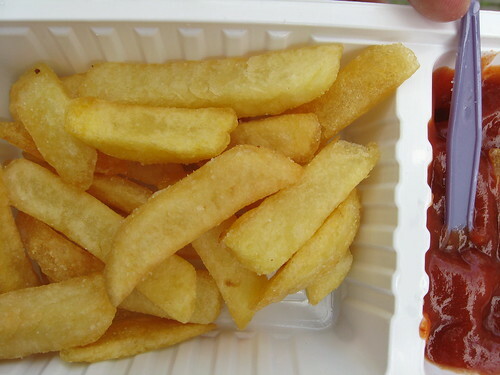 Fries and mayonaise is classic Amsterdam street food. I had this combo 7 years ago and my stomach still turns thinking about it. The fries are cooked perfectly; blanched til limp in oil and finished just before serving. I decided to identify myself as American and get them with some ketchup. Their ketchup was slightly spicy, not as sweet and more tomatoey and was the perfect complement to the perfect friet. The right spelling is friet :-) or patat! You didn't take any mayonaise on them?!? Hi Noskos. Thanks for the spelling correction. No, I'm sorry I didn't take mayo on them. I did it once before and it was horrible. I just couldn't stand it. And, we had to satisfy a grumbly 6 yr old who isn't handling the jet-lag well. Keep an eye out for future misspellings. We had Indonesian tonight, very nice.